Non-toxic play mats are a must-have. Register for a play mat or buy one soon after your baby is born to provide a non-toxic play and exploration surface. Play mats for babies are a wonderful thing to have. They’re great for tummy time when your baby is little, and also for giving your baby an opportunity to explore their world on their own as they get bigger. And once they are in the toddler stage, they make a great, non-toxic play surface. Let’s face it, we can’t hold our babies 24/7, even if we wanted to. Play mats for babies are a safe and comfy place where your baby can explore his teeny tiny world through various stages of growth. In addition to freeing up your arms for a few moments, a play mat offers your baby many benefits in terms of their cognitive, visual, and gross motor development. When my oldest son was born in 2014, I tried to find a non-toxic play mat but ended up falling for greenwashing tactics. We used an EVA foam play mat for longer than I’d like to admit. I finally ended up swapping it out for one of these washable rugs, but I still have mom guilt over it! The silver lining is that I knew what to buy the second time around, and now I can apply that knowledge toward helping you find the perfect non-toxic play mats for your home. What are the Best Non-Toxic Play Mats for Babies? With so many options out there – and so many different materials – it can get confusing knowing which brands make truly non-toxic products, and which ones are simply greenwashing. To help you out, I’ve put together a list of the top 12 most authentically non-toxic play mats for babies. I think you can’t go wrong with any of these. Bonus – many of these also double as great photo shoot props. Made in India. These are handmade rugs, made from 100% natural cotton and non-toxic dyes. In addition to being adorable, the unique aspect of Lorena Canals Rugs is that they are machine washable – something that really makes life a whole lot easier for parents with curious toddlers! Since each rug is hand-made, there might be slight variations in shape/color. Lightweight and portable, these rugs are only 4’x6′ so they are a little on the small side. We use one as a rug in our playroom and the fact it is machine washable makes me not worry that it isn’t as large as I’d prefer it to be. They do not have a backing, so they will be a little slippery on hardwood floors, but we have thankfully not experienced issues with our rug causing any falls. Though you can find these on Amazon, I find that the best selection of Lorena Canals Rugs can be found at buybuyBABY. Made in South Korea. CreamHaus was founded by a father who was worried about the level of toxicity in children’s products. The company is also very transparent about their toxicity reports which they have published on their website. I love that! CreamHaus USA’s Folding Play Mat is made from OEKO-TEX certified food-grade, low-density polyethylene (LDPE) foam which is widely recognized as one of the safest plastics there is. Ten thin layers of PE foam sheets are laminated together using an adhesive method that is chemical free. This play mat comes in three sizes: 39.5″ x 71″, 51″ x 79”, and 51″ x 102”, all of which give your baby plenty of room to play. Despite its size, it’s also lightweight and can be easily folded up and put away to store. Parents love that this mat is super thick – it helps them feel assured that their child is safe from bumps and bruises. The mat is waterproof and can be easily wiped clean. Made in South Korea. Also from CreamHaus is the modular cube play mat. The great thing about this mat is that you can adjust the size to fit your needs. Sold in sets of four cubes (25.6” X 25.6” for each cube), you can start off by buying one set, and as your baby grows older, you can buy and attach more sets for creating a larger play area. 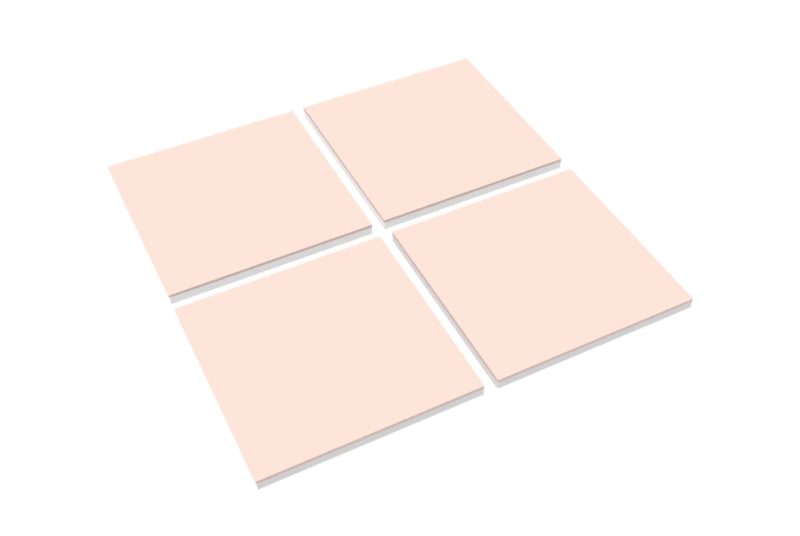 With Velcro strips on all sides, each individual mat easily attaches to other mats. Boasting a 1.6 inch thickness, you can feel assured that the mat will help keep your little one safe from bumps and bruises. Made from closed cell non-cross linked PE foam, it is laminated into 10 layers of foam sheets (using a chemical-free adhesive method). Made in Ukraine. This is an organic play mat, made with non-dyed linen fabric; the inner is hemp fiber. Handmade, the mat measures approximately 51 x 51” with 2.3” thickness. Customized orders can be placed as well depending on the size/thickness that you are looking for. Made in Australia. 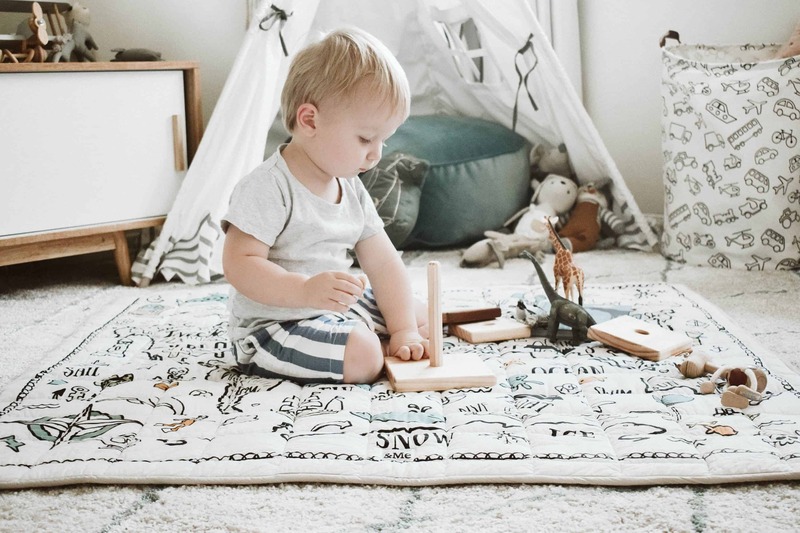 Finch & Folk sells organic playmats made with soft, GOTS-certified organic cotton sateen and filled with OEKO-TEX certified polyester. Finch & Folk’s playmats feature soft colors and beautiful designs, making these playmats gender neutral for the most part. Quilted with parallel line designs, this is an aesthetically made play mat that will look great in all children’s rooms. 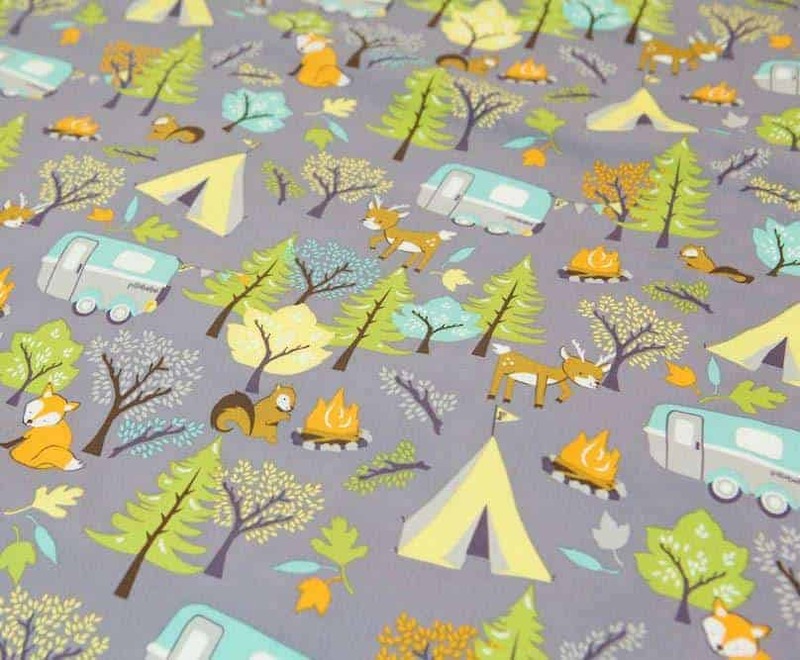 This playmat measures 47″ x 47″ and is also machine washable – yay! If you use any products that contain polyester, I prefer that it is OEKO-TEX certified, which ensures that it poses no risk to human health. This makes the Finch & Folk playmats safer than mainstream brands like Skip Hop, for example, which also uses polyester but doesn’t have this third-party certification. This particular design I’ve featured in the photo above – the World Explorer Play Mat – depicts places and features from all over the world, making it a uniquely interactive play mat for toddlers and preschoolers. They also have round playmats and other adorable designs to choose from. Shipping to the United States is roughly $26. Made in Australia. SpotandStripe makes padded blankets that double as playmats. Made with a 100% GOTS certified organic cotton outer cover, this is a versatile play mat that is portable, modern and comfortable. With polyester padding and an unbleached cotton liner, this 37” x 37” mat is a great and affordable choice. And the great thing is that customizable orders can be placed – you can ask for a particular print, size or shape that you are looking for and even request a waterproof liner if you intend to use the mat for outdoor purposes. Made in USA. 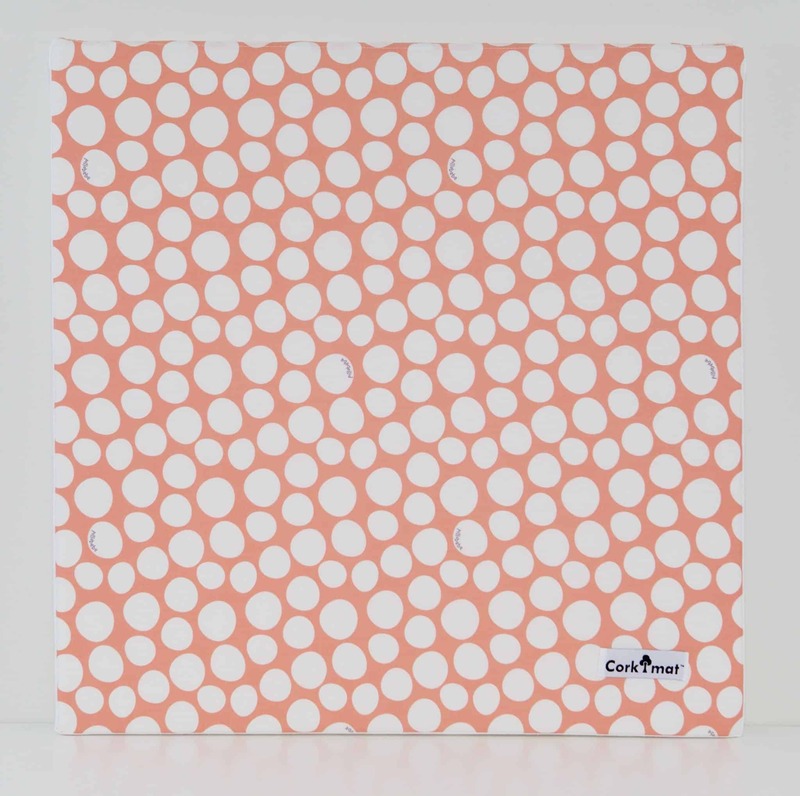 Made from 100% Organic Cotton, the Pillobebe Organic Cotton playmat is an excellent choice for a non-toxic playmat. Measuring approximately 55” by 55”, the mat is large enough for your baby to play on but still compact enough for you to roll up and take over to grandma’s house. It has an anti-slip feature that is particularly helpful as it helps to ensure that the mat does not move around despite being made from cotton. The removable cover helps make it easy to wash. Overall, this is a great choice and it comes in several designs for you to choose from. Note: if you have hardwood floors, choose the double padding option. If that won’t be thick enough for you, you may need to consider the CorkiMat or another non-toxic play mat from this list. 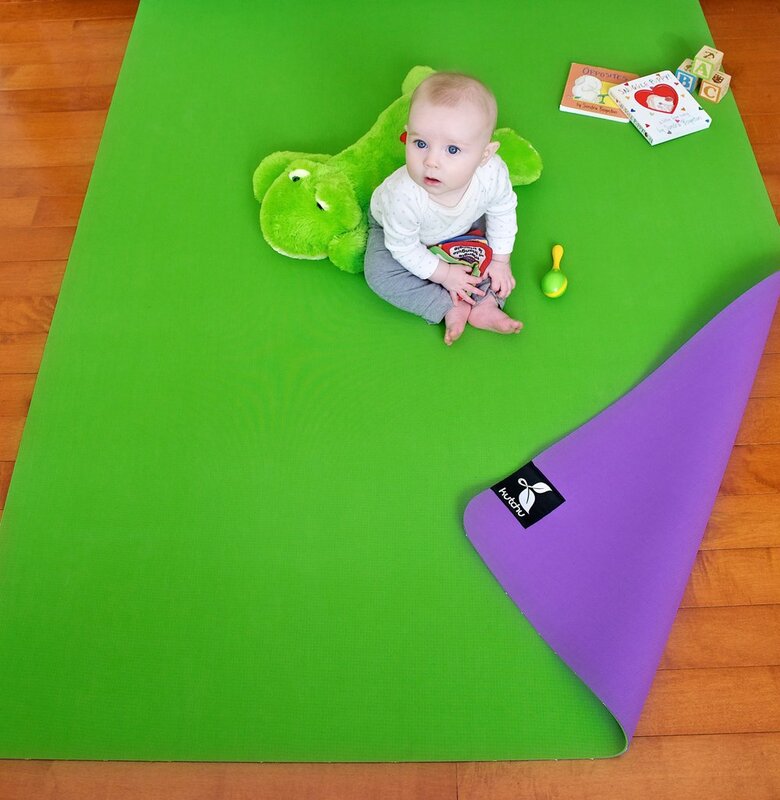 [Discontinued – buy it secondhand if available] Made from 100% natural rubber (using the sap of non-rainforest rubber trees), this play mat somewhat resembles an oversized yoga mat. Because it is made from natural rubber, it is ideal for use on hardwood floors and is naturally non-slip. Measuring approximately 51” X 66”, the Kutchu gives your little one ample room to play on its natural, non-toxic surface. This item has been discontinued but occasionally comes in stock as a warehouse deal at Amazon. Check for availability! Made in USA. CorkiMat play mats are modular and the size is customizable depending upon your play space. Featuring beautiful designs, the CorkiMat is approximately 24” in size and fits together with Velcro squares. The cover is made from 100% GOTS Certified Organic Cotton and the padding is polyester. For the most part, I’m ok with polyester unless your baby has signs of food or environmental sensitivities. Made in Egypt. 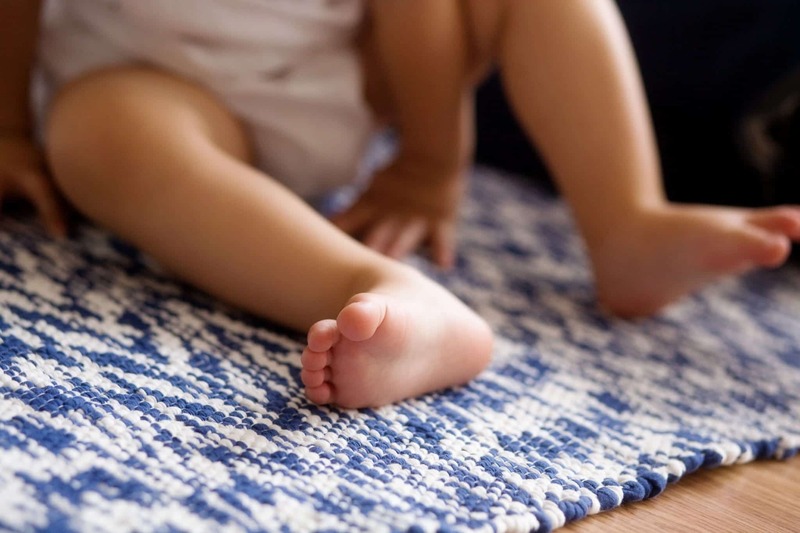 Under the Nile Cotton rugs are hand-made using 100% GOTS-certified organic Egyptian cotton. They are machine washable, which makes them a great choice for a play mat. Since they are cotton, though, they are a bit slippery on hardwood floors. If you have carpet, though, these are a no brainer! The Small Rug is pretty portable and can be used as a play area for your little one at home or on the go. The Big Rug makes a great play mat for a larger area such as a bedroom, living room, or playroom. 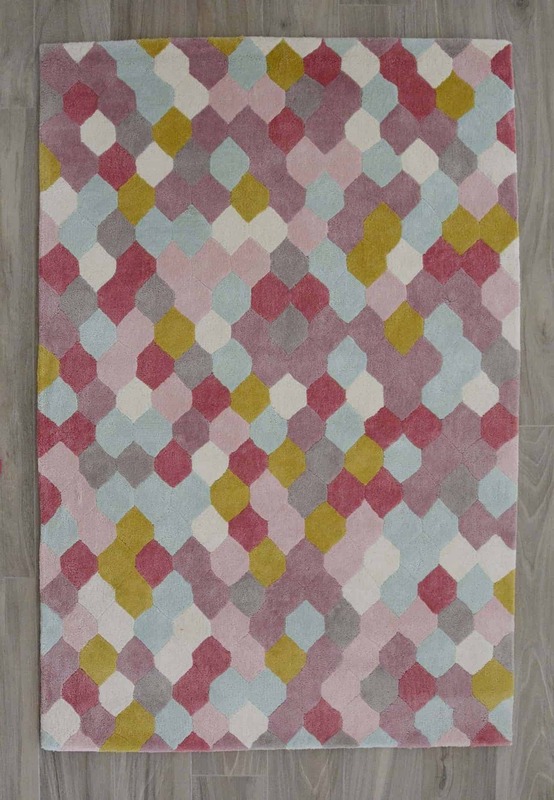 These rugs are popular that they often sell out quickly. So if you have your eyes on these rugs and see that they’re available, don’t hesitate to place your order! Under the Nile is a great, responsible company that makes many organic cotton products for babies. They have a long track record and I feel good about using their products and recommending them to my friends and readers. 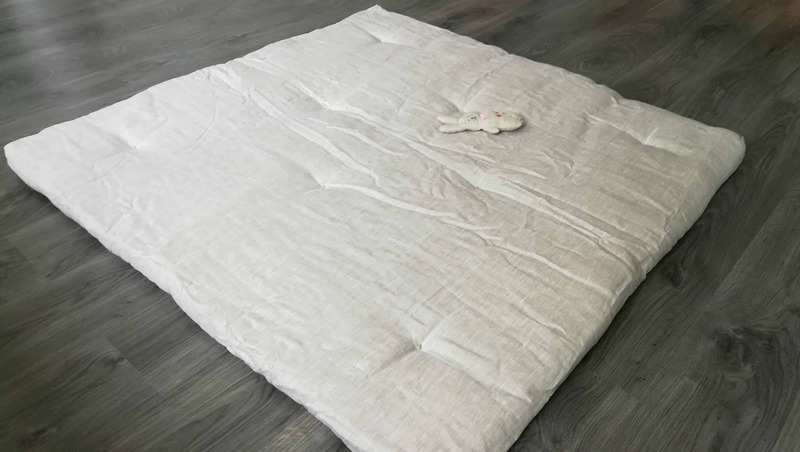 Made out of soft organic cotton, this is a lightweight play mat that is perfect for taking along with you in your diaper bag; For trips to the park, tummy time, or placed under a baby play gym, this is a versatile mat that is designed to meet your baby’s needs. The mat measures approximately 39 1/3″ x 39 1/3″ and folds up into a pretty small size and ties up with a small cotton drawstring, making it extra portable. The outer cover is made from 100% GOTS-certified organic cotton sweatshirt knit while the filling is made from organic cotton wadding. Shipping to the United States is $15 on this amazing non-toxic play mat. Made in India. Made from 100% certified GOTS organic cotton and wool and with GOTS-certified natural and organically grown dyes, Lavender & Loom rugs are hypoallergenic and free from harmful chemicals. They are ultra-soft and make a great play area for babies. If you’re looking to invest in a high-quality organic rug for your nursery or playroom, Lavender & Loom is your go-to. Hand woven by artisans in India, each piece is uniquely designed and crafted. The rugs make use of beautiful, all-natural color combinations that add elegance and beauty to your home.